Plants not only beautify and enrich an office environment; they help clean the air of indoor pollutants, which may contribute to sickness. According to a 2-year study by NASA, findings suggest that common houseplants play an active role in absorbing harmful chemicals and gases like formaldehyde, benzene and carbon monoxide. Choosing suitable plants for your office will clean and revitalize the air quality and enhance any room by breathing freshness into your decor. Golden Pothos (Scindapsus aureus syn. Epipremnum aureum), with its shiny, green leaves streaked with gold, is excellent for removing formaldehyde molecules from the air. New carpets are often laden with formaldehyde fumes, which may result in workers suffering headaches and sickness. Golden pothos helps reduce these and other pollutants by converting bad air to good. 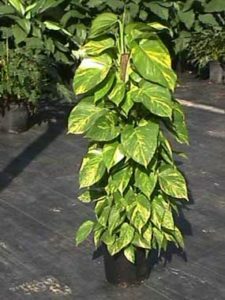 This specimen of pothos may reach 18 inches in height with multiple vines up to 10 feet in length. Thriving in little light, golden pothos require moderate watering and are easy to care for.